It is 50 years on from the milestone Sexual Offences Act of 1967 which partially decriminalised homosexuality in England and Wales (Scotland was to follow later) and we are asking what progress will the next 50 years bring? We will be debating the motion This House believes that labels like “LGB and T” will be irrelevant to future generations in our increasingly gender-fluid world. We invite you to join us for our youth debate as we celebrate this anniversary. We will discuss whether the labelling of gender identities we currently apply will still be relevant in 50 years’ time or do we wish to move towards a label-less world? The debate will be bringing the voice of young people, those who will be affected by any changes over the next fifty years, to the debate through iDebate’s World Debate Clubs. 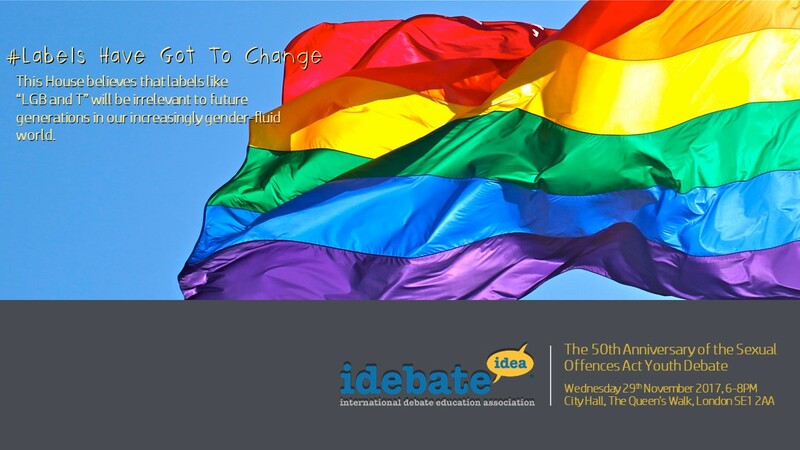 iDebate has 15 debate clubs from across London participating in the World Debate Club. It is a weekly programme for FE students that runs every Wednesday during enrichment for 1-2 hours. We provide training in debate and skills such as public speaking as well as providing the opportunity to discuss diverse controversial and up to the minute events from local community issues to international politics. Find out more at our Eventbite page. P.S. Help iDebate survive; we have a funding application in a competition by Aviva. Anyone can register and vote for the World Debate Club.